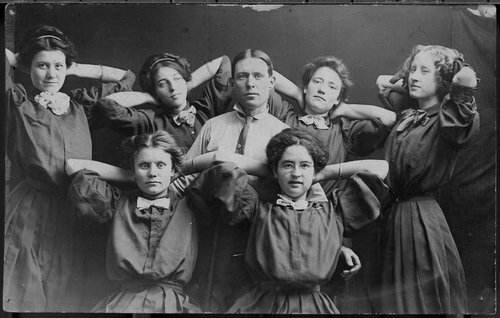 This photograph shows members of the Cimarron High School women's basketball team with their coach in Cimarron, Kansas. Women in the photograph are identified as (back row) left to right: Maud Butcher, Earna Hildebrand, Alice Clem, Bessie Yeiter, (front row) Vern Dillman and Mary Evans. The coach is not identified.